The last dancing bear in the Ukraine has been rescued by FOUR PAWS. Kristina's days of being paraded around by her owner are over as she settles into the Domazhyr bear sanctuary. The last dancing bear in the Ukraine has been rescued by FOUR PAWS, the international animal welfare organization. For the bear named Kristina, her days of being paraded around by her owner in restaurants and travelling circuses have finally come to an end. Two weeks ago, Kristina was due to make an appearance in Ivano Frankove in Western Ukraine. Moments before her appearance, Ukrainian authorities confiscated her with supervision of FOUR PAWS. Following Kristina’s confiscation, hour-long negotiations with Kristina’s uncooperative owner took place. In the end, police and environmental inspectors had to intervene and seize the bear. FOUR PAWS immediately brought Kristina to the newly-built BEAR SANCTUARY Domazhyr near Lviv, where she will now be monitored by veterinary experts and can find peace and quiet. Kristina spent most of her life trapped inside a tiny cage in her owner’s van, where the temperature reached 90 degrees Fahrenheit. Her owner forced her to perform in circuses or in pedestrian areas repeatedly. In winter when the entertainment season was over, Kristina was kept in a tiny, unsanitary shed on the site of a fish factory. Today, however, she has enough space to move around as much as she wants. FOUR PAWS is in the process of building a new bear sanctuary near the Ukrainian town Lviv, which will house up to thirty bears. The first construction phase of BEAR SANCTUARY Domazhyr will finish in fall of 2017. When completed, up to six rescued bears will find a home in a 19 acre enclosure. More construction work will be done in the coming years, and when finished, the site will encompass 50 acres. 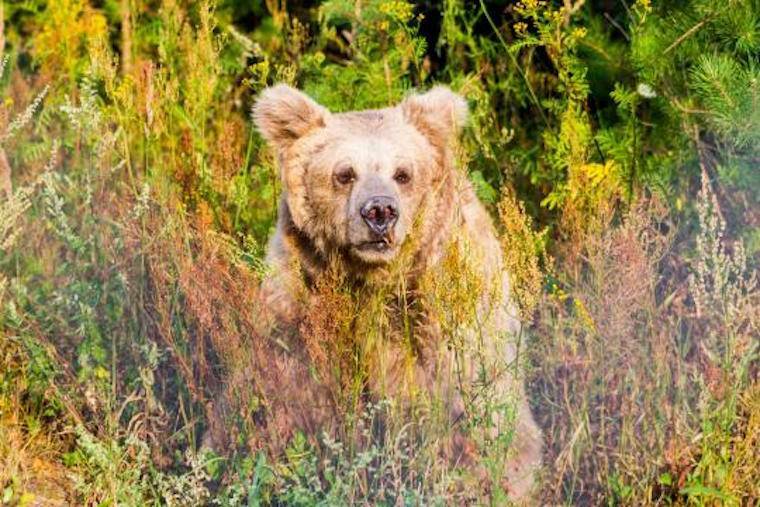 At the beginning of July, FOUR PAWS rescued another Ukrainian bear named Potap and brought him to BEAR SANCTUARY Domazhyr as its first resident. The former restaurant bear had been abandoned by his owner, and was only being fed meager amounts of food. Now, both Potap and Kristina can recover from their suffering at BEAR SANCTUARY Domazhyr, where they can finally lead a happy life.